t is difficult to believe that the National Socialists could find any sympathy with Wagner's Parsifal, a work that tells of enlightenment through fellow-suffering. A number of writers have claimed that Parsifal found favour with (at least some of) the Nazis. Some Nazi ideologues expressed serious doubts about this opera but the party was led by Wagner enthusiast Adolf Hitler, who was as fanatical about Wagner's music as he was in his beliefs about Aryan superiority and his destiny to rid the world of communism. At the age of twelve, I saw ... the first opera of my life, Lohengrin. In one instant I was addicted. My youthful enthusiasm for the Bayreuth Master knew no bounds. dolf Hitler first visited Haus Wahnfried in September 1923. After visiting the grave of Richard and Cosima Wagner, the future Führer said, If I should ever succeed in exerting any influence on Germany's destiny, I will see that Parsifal is given back to Bayreuth . He was referring here to the Lex Parsifal for which the Wagner family and their supporters had campaigned a decade earlier, i.e. a special copyright law that would restrict performances of Parsifal to Bayreuth. However, when German copyright law was being revised in 1934, Hitler decided that he could not honour his earlier promise to the Wagners; in November 1941 he told Goebbels that the opera was not to be reserved for Bayreuth alone. 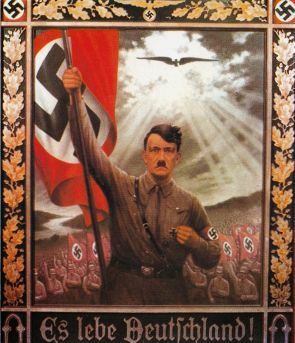 Left: Hitler portrayed as Parsifal, with an eagle replacing the dove. 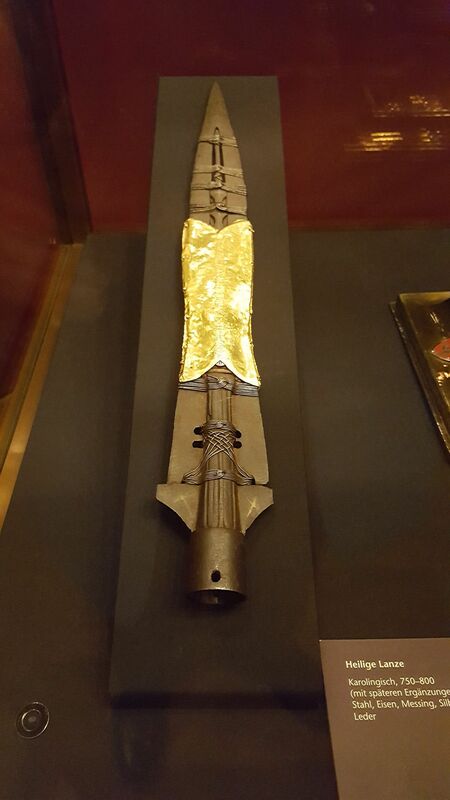 Below: the Spear of Destiny, to be seen in the Hofberg museum in Vienna. This is one of several spearheads that have been claimed as the spear of Longinus. It carried into battle by, amongst others, Henry the Fowler and Frederick Barbarossa. It has been claimed (Trevor Ravenscroft, Spear of Destiny, 1973) that it held a special significance for Adolf Hitler.1 At the end of Syberberg's Parsifal film, it is a reproduction of the Spear of Destiny that the boy Parsifal brings into the Grail temple3. "What is celebrated is not the Christian Schopenhauerian [sic] religion of compassion, but pure and noble blood, blood whose purity the brotherhood of initiates has come together to guard. The king then suffers an incurable sickness, caused by his tainted blood. Then the unknowing but pure human being is led into temptation, either to submit to the frenzy and to the delights of a corrupt civilisation in Klingsor's magic garden, or to join the select band of knights who guard the secret of life, which is pure blood itself. All of us suffer the sickness of miscegenated, corrupted blood. How can we purify ourselves and atone? Note how the compassion that leads to knowledge applies only to the man who is inwardly corrupt, to the man of contradictions. And that this compassion admits of only one outcome, to allow the sick to die. Eternal life, as vouchsafed by the Grail, to those who are truly pure and noble!" "Wagner's line of thought is intimately familiar to me", Hitler continued more animatedly. "At every stage of my life I come back to him. Only a new nobility can bring about the new culture. If we discount everything to do with poetry, it is clear that elitism and renewal exist only in the continuing strain of a lasting struggle. A divisive process is taking place in terms of world history. The man who sees the meaning of life in conflict will gradually mount the stairs of a new aristocracy. He who desires the dependent joys of peace and order will sink back down to the unhistorical mass, no matter what his provenance. But the mass is prey to decay and self-disintegration. At this turning- point in the world's revolution the mass is the sum of declining culture and its moribund representatives. They should be left to die, together with all kings like Amfortas." Hitler hummed the motif, Durch Mitleid wissend. his interpretation seems to stand Wagner's poem on its head. In Parsifal, as Hitler knew, the sick are not allowed to die: the Grail keeps them alive. If we are to believe Rauschning's account, then Hitler's (reported) interpretation might have been based upon a misreading of Wagner's late essays on Religion and Art. However, there is no reliable evidence that Hitler had read any of Wagner's prose writings3. If he had read the late essays, then it would seem that Hitler chose to disregard Wagner's belief in the pure blood of Christ as the cure. n his book Hitler and the Power of Aesthetics, Frederic Spotts is sceptical concerning August Kubizek's claim that the young Hitler read Wagner's prose writings and letters. Even more so concerning Joachim Fest's claim that Wagner's prose was Hitler's favourite reading matter. There is no corroborative evidence for either of these claims. Hitler never ascribed any of his views to Wagner, not in Mein Kampf, his speeches, articles or recorded private conversations... Indeed, there is no evidence that Hitler ever read Wagner's collected writings, much less that they were "his favourite reading". The origin of the myth is probably Kubizek's book 4, in which the youthful Hitler was said to have read every biography, letter, essay, diary and other scrap by and about his hero that he could lay his hands on. But Kubizek himself contradicted that story in his wartime Reminiscences, which he later expanded into the more marketable, post-war book Young Hitler. Footnote 1: Charles Lawrie has demonstrated that Ravenscroft's book contains not only fact but also fiction. There are elements of historical truth in his The Spear of Destiny ... but central things claimed as historically true were not . Ravenscroft's book together with Rauschning's book (see below) has been the inspiration and source for an entire literature concerning Hitler and the occult, with very little (if any) basis in historical facts. Footnote 2: In the early 1930s Hermann Rauschning was the leader of the Nazi party in Danzig. After he defected from the party and from Germany, Rauschning claimed to have been a close personal friend of Hitler, and he wrote the book from which the above quotation has been taken. His book contains the only "record" of Hitler speaking at length about his relationship with Wagner, and the only account of Hitler discussing Wagner's ideas rather than his music. As was often the case with defectors of later decades, Hermann Rauschning tried to satisfy the curiosity of his new masters even when his information was very limited; and like other defectors, he exaggerated his own importance and the extent of his high-level contacts. In recent years it has been shown that passages in this book were compiled, by Rauschning and his ghost-writer, from Hitler's speeches or other sources; not recalled from conversations with Hitler. As far as it has been established, Rauschning only met Hitler on a few occasions at Nazi party functions and their conversations consisted of small-talk. Although there is no direct evidence that the passage quoted above is Rauschning's invention, like everything in his book that is not corroborated by other sources, it might not be genuine. The balance of probability is that this quotation (often quoted as evidence of Wagner's influence on Hitler) was made up by Rauschning. In his acclaimed biography of Hitler, Ian Kershaw wrote: I have on no single occasion cited Hermann Rauschning's Hitler Speaks, a work now regarded to have so little authenticity that it is best to disregard it altogether . Footnote 3: (From Wikipedia) Dr. Robert Feather, an English metallurgist and technical engineering writer, tested the lance for a documentary in January 2003. He was given unprecedented permission not only to examine the lance in a laboratory environment, but was allowed to remove the delicate bands of gold and silver that hold it together. In the opinion of Feather and other academic experts, the likeliest date of the spearhead is the 7th century A.D. – only slightly earlier than the Museum's own estimate. However, Dr. Feather stated in the same documentary that an iron pin – long claimed to be a nail from the crucifixion, hammered into the blade and set off by tiny brass crosses – is "consistent" in length and shape with a 1st-century A.D. Roman nail. According to Paul the Deacon, the Lombard royal line bore the name of the Gungingi, which Karl Hauck and Stefano Gasparri maintain identified them with the name of Odin’s lance, Gungnir (a sign that they probably claimed descent from Odin, as did most of the Germanic royal lines). Paul the Deacon notes that the inauguration rite of a Lombard king consisted essentially of his grasping of a sacred/royal lance. Milan, which had been the capital of the Western Roman Empire in the time of Constantine, was the capital of the Lombard kings Perctarit and his son Cunipert, who became Catholic Christians in the 7th century. Thus it seems possible that the iron point of the Lombardic royal lance might have been recast in the 7th century in order to enshrine one of the 1st-century Roman nails that St. Helena was reputed to have found at Calvary and brought to Milan, thus giving a more Christian sacred aura to the old pagan royal lance. If Charlemagne’s inauguration as the King of the Lombards in 774 had likewise included his grasping of this Christian sacred lance or royal lance, this would explain how it would have eventually become the oldest item in the German imperial regalia. The Iron Crown of Lombardy (dated to the 8th century), which eventually became the primary symbol of Lombardic kingship, takes its name from the tradition that it contains one of the holy nails. Gregory of Tours in his Libri Historiarum VII:33, states that in 585 the Merovingian king Guntram designated his nephew Childebert II his heir by handing him his lance; it is possible that a royal lance was a symbol of kingship among the Merovingian kings and that a nail from Calvary was in the 7th century incorporated into this royal lance and thus eventually would have come into the German imperial regalia. Footnote 4: Adolf Hitler Mein Jugendfreund, 1953; abridged and translated into English as Young Hitler: The Story of Our Friendship, 1955. A more complete English edition appeared in 2006 under the title The Young Hitler I Knew, with a useful introduction by Ian Kershaw.